Having been in operation for over 80 years, Duncan Solutions has built up an enviable reputation. Though best known as an innovative parking meter company, the truth is, the Duncan Solutions of today is a cutting-edge, forward-thinking business dedicated to making Australia and New Zealand’s cities smarter. Their Parking Enterprise Management System (PEMS) is at the frontier of integrated smart city solutions – and it’s the thinking behind this innovation that inspired the brand refresh. In the eight decades Duncan Solutions has been in business, they have evolved from a humble manufacturing firm to a technology organisation that develops industry-leading products which continue to transform the way that cities operate their parking and traffic management. Additionally, their experienced, professional team have long supported world-leading partner products that can only enhance the end user’s experience, which is something reflected in the brand update. The “smart city” industry is in the midst of a revolution right now. Australia’s major urban areas are constantly locked in a never-ending struggle with increased vehicle congestion – the Australian Bureau of Statistics states that there are 18.4 million registered motor vehicles on the road as at 31 January 2016. This has led to a scarcity of car parking spaces, and Duncan Solutions’ PEMS technology is designed to keep paid parking management simple and efficient. PEMS can integrate real-time data from parking payment machines, in-ground sensors and vehicle detection cameras. It’s possible to pay via smartphone or a motorist guidance application specifically designed for such purposes. This integrated data is accessible via a range of inquiry screens, dashboards and powerful business intelligence reports. To gain a little insight as to how the products work in the real world, be sure to take a look at their video, which explains everything more clearly than words ever could. If you’d like to become part of the Duncan Solutions revolution, download a product brochure to find out what they can do for you – you’ll be amazed at how futuristic the parking management industry has become. The new logo offers a simple, cohesive mark that will work across multiple platforms. The circle represents the idea of ‘integrated solutions’ through its shape, but also via the colours that blend seamlessly into one another. That circle also alludes to a message of connectivity, integration and communication, without focusing on a specific area. This gives it the power and flexibility to function across future product and service areas. Additionally, the arrow within the circle represents the dynamic, forward-thinking company that Duncan Solutions has become. 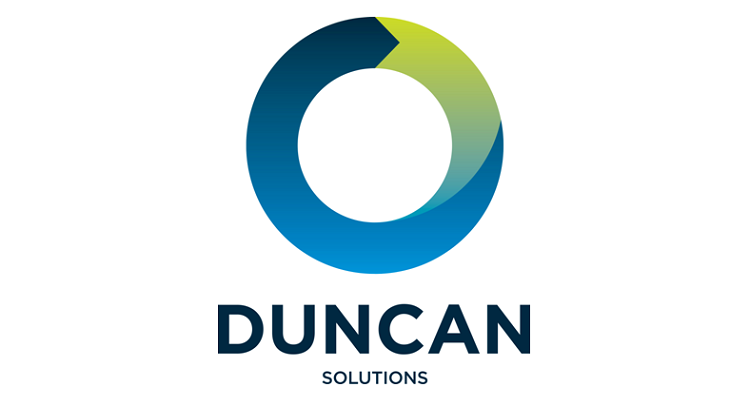 “Duncan Solutions’ new branding reflects the transition of our company to a smart technology solutions provider with a focus on the future requirements of cities and councils” said Chief Executive Officer Trent Loebel. Duncan Solutions are keen to see the modern new branding make similar waves in the industry as our parking solutions – be sure to visit the website to see it in action.